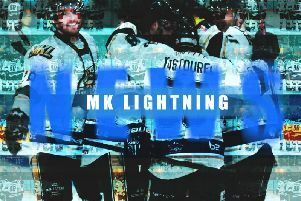 Milton Keynes Lightning were finally able to give a debut to defenceman Nelson Armstrong on Sunday – and he made an immediate impact as his new team stunned high flying Nottingham Panthers with a morale boosting 5-1 victory. Lightning struck no less than four times in less than three second period minutes to send top of the table Panthers reeling. It went some way to making up for a disastrous trip to Belfast where the Giants cruised to easy 5-1 and 7-0 wins against Milton Keynes on Friday and Saturday. Canadian blue liner Armstrong’s arrival in the country had been delayed by visa problems – he missed Lightning’s Belfast games but made his first appearance in the home clash with Nottingham Panthers on Sunday. With less than 12 minutes gone he dropped the gloves to fight with Panthers’ experienced Brit forward, Robert Farmer. The result was for Armstrong a total of 17 minutes off the ice for fighting while Farmer picked up two minutes for incitement and five for fighting. Panthers ran into double penalty trouble just before the mid point of the second period when Tyler Vankleef was sin binned for a high stick and then the team was penalised for having too many men on the ice. A well worked move involving Andreas Valdix and Tim Wallace saw Eric Neiley have an easy tap in at 30mins 11secs – just after Vankleef had returned to the ice. Radek Meidl then fired in unassisted at 30mins 43secs and while Panthers were still recovering Neiley and Wallace had the assists on Michael Fine’s goal after 31mins 23secs. Home fans could hardly believe it when their heroes stretched the lead to four just seconds into a roughing penalty on Farmer – Neiley bagging his second goal at 32mins 54secs. Panthers started to lose the plot at this stage with Jacob Doty picking up a two minute misconduct penalty seconds later and then Guillaume Lepine going toe to toe with Clay Anderson – resulting in five minute penalties for fighting for both combatants. Even when Fine was sent to the cooler for hooking Panthers could not cut the deficit. But after regrouping, Panthers started to hit back with the better chances early in the third period, eventually scoring on 46mins 5secs through Luke Pither. The gloves were off again when Lightning’s new youngster James Hounsome did battle with Jaynen Rissling – drawing five minutes in the sin bin for both for fighting. Panthers withdrew netminder Michael Garnett for the extra skater with over two minutes remaining, giving Wallace the chance to register an empty net strike on 57mins 58secs. On Friday at the SSE Arena, Belfast scored three goals in just over three third period minutes to inflict a 5-1 defeat with the city side giving a debut to 19-year-old Brit signing Hounsome. Belfast took the lead on 16mins 9secs when goalie Patrick Killeen was beaten by Francis Beauvillier. Lightning drew level when Georgs Golovkovs struck at 24mins 43secs – their solitary goal. It was a too many men penalty on Lightning that gave Belfast the chance to go in front as Kyle Baun registered to make it 2-1 on the powerplay after 36mins 23secs. Former Lightning player Jonathan Boxill extended the hosts’ lead after 45mins 36secs before a five on three penalty kill was the visitors’ undoing. First Valdix went for cross checking and then Clay Anderson delayed the game. Belfast made the most of it with Patrick Dwyer taking the tally to 4-1 at 47mins 29secs. Lightning conceded a fifth goal to Riley on 48mins 45secs – prompting the replacement of Killeen by Adam Goss. 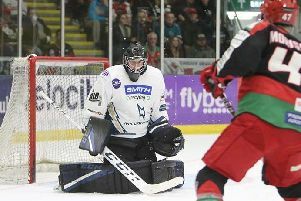 The following night, MK were demolished by Giants in a 7-0 shut-out. Belfast took the lead on 5mins 3secs with a Darcy Murphy top shelf shot before the scorer’s big hit on Hounsome earned him a two minute penalty for interference. Hounsome was stunned and retired from the game. Dwyer hit goal two when he skated in on goal unhindered to beat Killeen on 13mins 14secs. Lightning’s bright start to the second period came to an end when Rihards Grigors was sin binned for holding in the 25th minute. Kyle Baun finished off for Giants’ third marker at 26mins 58secs. Eight minutes from the break when Murphy crashed the puck towards goal – it landed in the back of Dwyer’s shorts. He backed into the goal with the puck intact but the officials, after watching a video replay, they disallowed the attempt. Goal number four did come when Killeen was unable to stop Dwyer on 36mins 26secs. Both teams changed goalies for the third period – Stephen Murphy replacing Beskorowany for Giants and Adam Goss taking over from Killeen. As Valdix was serving time for a high stick Baun got the final touch to score at 49mins 7secs. Murphy fired in after 50mins 19secs to make it 6-0 and the same player completed his hat-trick with 2mins 31secs to go.